Hillary certainly threw some flowery words of friendship during her Speech at AIPAC today, if one ignored the truth she may have even seemed pro-Israel. But the truth is the “red meat” she tossed out at the AIPAC conference, wasn’t Kosher it was nothing but rancid lies. In fact, out of the three major candidates left in the race, Clinton, Trump, and Cruz, Hillary Clinton is the only one that can be described as anti-Israel. Hillary Clinton took a swing at Republican front-runner Donald Trump Monday by saying she wouldn’t insist on being “neutral” in an Israeli-Palestinian negotiation, as he has. “America can’t ever be neutral,” Clinton said at the AIPAC meeting. And it’s true, Hillary has never been neutral, she’s always been anti-Israel. If one looks at Hillary Clinton’s public history one finds a lifetime of anti-Israel positions. But wait some might say, Hillary was a big supporter of Israel when she was in the U.S. Senate. Indeed, she was. With the possible exception of the time from her first campaign New York’s Senate seat in 2000 to her resignation from the Senate to become Secretary of State in January 2009– except for the time she needed New York’s Jewish voting bloc, Hillary Clinton has never been pro-Israel. Some might even claim that she is also anti-Semitic. Even before her marriage to Bill, Hillary Clinton was anti-Israel and promoting the forces of terrorism. In his book American Evita on page 49, Christopher Anderson writes. On page 50 of the same book, the author relates a 1973 anti-Semitic incident where she Hillary refused to enter a home that a menorah on its door. It was during this trip to his home state that Bill took Hillary to meet a politically well-connected friend. When they drove up to the house, Bill and Hillary noticed that a menorah-the seven branched Hebrew candelabrum (not to be confused with the more common and subtler mezuzah)-has been affixed to the front door. Mrs. Clinton sat by silently listening to a real-time translation, and the gave the terrorist’s a wife hug and kiss when she finished speaking. Later, many hours after the event, and only after a media furor put her on the spot for what many view as a bit more than a mere political “boo boo Mrs. Clinton called on all sides to refrain from “inflammatory rhetoric and baseless accusations.” She included Israel even though her leaders made no such accusations. Glossing over this repugnant affair, Hillary Clinton has yet to specifically contradict and denounce the monstrous lies uttered by Yasser Arafat’s wife in her presence. Years later she did attempt to make feeble attempt at an excuse—the translator screwed up. My third question is about Israel, we spend too much money, $6 billion dollars to Israel funding apartheid! There is not the shared values that we are supposed to share with Israel! Ms. Clinton was silent about question number three, once again she had the opportunity to show that she was a friend of the Jewish State and correct a slander and once again she was silent. This time however she couldn’t blame the translator. Before her tenure in the State Department, Bill and Hillary Clinton made mega dollars from their extensive involvement with Dubai. Besides being a leader in the movement to boycott Israel, Dubai is the “Hong Kong” of the terrorist world. I learned about Dubai last year when the daughter of a friend of our family got married there. We checked after we received the invitation and learned that anyone with a passport that displayed they once traveled to Israel would not be allowed into the country. Bill and Hilary are major friends of Dubai, to the point where the Clinton Foundation have established Dubai Study departments in universities in the US and London. They worked hard at granting legitimacy to this Jew-hating, terrorist supporting nation. The Clintons also had a connection to what was back then, the world’s biggest exporter of terrorism, Saudi Arabia. The Saudi Royal Family donated $10,000,000 to the Clinton Library. According to a 1993 New York Times article, Prince Turki bin Feisal was a college classmate of Bill’s at Georgetown University and (at the time of the article’s writing) was the head of the Saudi Arabian intelligence service. While he was still governor of Arkansas, it looks like Bill Clinton cashed in on that relationship, “work[ing] hard to secure a multimillion-dollar Saudi donation to a Middle Eastern studies program at the University of Arkansas.” Due to the intervention of the Gulf War, the first installment of $3.5 million didn’t arrive until 1992, with another $20 million arriving after Bill Clinton’s first inauguration. During her Senate years Ms. Clinton became a vocal supporter of Israel because she needed the Jewish vote. But one of her first actions after leaving the Senate and becoming Secretary of State was to ignore a previous deal with Israel and call for the end of the construction of new homes in existing settlement neighborhoods. Clinton’s demand for a building freeze in existing settlement communities broke a US/Israel agreement made during the Bush administration. While she said there was never an agreement between Israel and the US about natural expansion of existing settlements, Elliot Abrams who negotiated the agreement for the United States said Ms. Clinton’s contention is simply not true. This was a major error by the Clinton State Department and it was compounded by the inclusion of Jerusalem in the mix and the constant public berating of the Jewish State by Clinton and Obama that as we know, continued even after she left the administration. Immediately the Palestinians seized upon the Hillary-created settlement issue. Seeing an opportunity to avoid talking, they used the administration’s demands, to make a “settlement” freeze a precondition to further talks even though there were negotiations and construction going on simultaneously before Hilary Clinton became Secretary of State. As the end of the construction halt approached, the US began to negotiate with the Israel to extend the freeze. Based on their experience with Clinton denying the deal negotiated by Elliot Abrams during the Bush Administration, Israel demanded that any proposal be presented in writing, as any oral deal with Clinton and the Obama administration was worth the paper on which is was printed on. The written offer never came because Clinton, the Secretary of State wasn’t negotiating in good faith. Instead Ms. Clinton was playing “Bait and Switch.” As Israel waited for a letter clarifying America’s guarantees in exchange for a proposed building ban for Jewish residents of Judea and Samaria, a diplomatic source finally came forward saying that no such letter is on its way. Hillary Clinton misled Prime Minister Benjamin Netanyahu. The source, a senior diplomat with inside knowledge of Netanyahu’s recent meetings in Washington, said Clinton made commitments when talking to Netanyahu, but later slipped out of her commitments by claiming that she had not been speaking on behalf of U.S. President Obama, did not the end, did not give his approval. 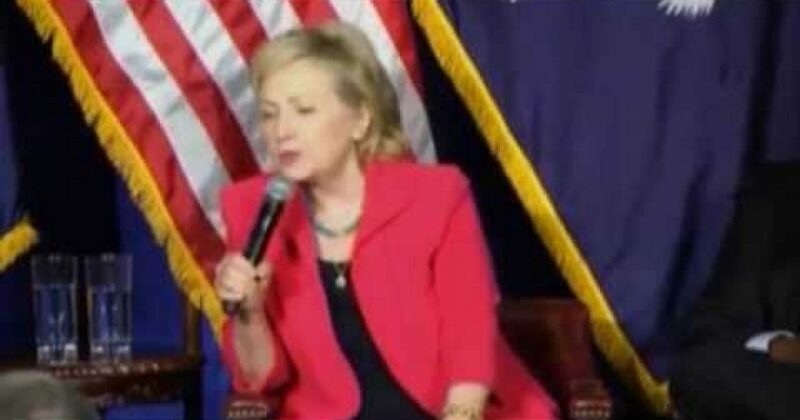 In 2011 speaking at the at the Saban Center for Middle East Policy part of the liberal Brookings Institute, Clinton trashed Israel by expressing concern for Jewish State’s social climate in the wake of limitations regarding female singing in the IDF and gender segregation on public transportation. Both were accommodations made to the Orthodox communities in Israel and Hillary’s complaints were based on false information. Clinton referred to the decision of some IDF soldiers to leave an event where female soldiers were singing; she said it reminded her of the situation in Iran. It did? Wow! In Iran the women would have been lashed or executed. In Israel they were allowed to sing, and the people who felt it was against their religious beliefs were allowed to walk out. That’s it! Most senior officers in the IDF supported the women’s right to sing. That’s called religious freedom. Clinton also spoke of her shock that some Jerusalem buses had assigned separate seating areas for women. “It’s reminiscent of Rosa Parks,” she said, taking the typical progressive position that faith should not matter outside a place of worship. Clinton’s statement was part of the continued attempt by the Obama administration/Clinton State Department to de-legitimize the Israeli democracy and destroy one of the reasons for American support of Israel, the fact it is the only democracy in the Middle East. When we left the city and visited Jericho, in the West Bank, I got my first glimpse of life under occupation for Palestinians, who were denied the dignity and self-determination that Americans take for granted” (pg 302). She says nothing about terrorism, such as blowing up buses with school children, nothing about the fact that during he presidency of her husband Yassir Arafat turned down a deal that would have given him about 98% of what he wanted (at least that’s what Bill Clinton said). “The sticking point would be Jerusalem. East Jerusalem had been captured along with the West bank in 1967, and Palestinians dreamed of one day establishing the capital of their future state there.” (pg 317). Hillary’s statement is totally biased. Israel didn’t capture Jerusalem; Jordan did in 1948. Jews were the majority of the Jerusalem Population from 1844 through the establishment of the State of Israel in 1948 when they were kicked out by Jordan. In fact, Muslims were the third largest religion in the city until about 1890. The Palestinian’s want East Jerusalem as their capital because they don’t want Israel to have it. Even after the Bar Kochba revolt in 135 CE when the Romans punished the Jews for revolting by changing the name of their country from Judea to Palestinia (after the Philistines the ancient enemy of the Jewish people who no longer existed) and the name of the holy city from Jerusalem to Aelia Capitolina (literally Capitoline Hill of the House of Aelius) , most of the world recognized the Holy Land and Jerusalem as Jewish. The truth of the matter is that even ancient Muslim writings recognized Jerusalem as a Jewish City. “There has been nearly a decade of terror, arising from the second intifada, which started in September 2000. About a thousand Israelis were killed and eight thousand wounded in terrorist attacks from September 2000 to February 2005. Three times as many Palestinians were killed and thousands more were injured in the same period.” (pg 308). Like many who are anti-Israel Hillary Clinton draws a false equivalency between the terrorist attacks on Israel and Israel’s attempts to defend herself. To maintain her ridiculous logic, the US should be chastised because more al Qaeda terrorists died than Americans were killed on 9/11/01. The second intifada was a horrible period of Palestinian terrorism against Israeli civilians, bus loads of children blown up, pizza places bombed, even a hotel where families were celebrating the Passover Seder in peace. There is no equivalence between the attacks and Israel’s attempts to defend herself. The page 312 quote was reminiscent of John Kerry’s apartheid remark (which he backed away from). What Israel’s deputy defense minister Danny Danon said about Kerry’s remark applies here also. To suggest that the Jewish people would ever establish an apartheid regime was particularly hurtful. Equally hurtful was the implied double standard. Although the administration has from time to time chided the Palestinians for “unhelpful” steps, those comments have not come close to the pointed criticism that has been leveled at our government. This policy of sharing the blame for the collapse of the peace talks, which from the outset was deemed by most independent experts as a long-shot attempt at best, has created the illusion of parity between the two sides. The secretary’s comments make it seem that Israel’s decisions to issue housing tenders, or to exhaustively debate whether to release convicted murders who would have very likely received the death penalty in U.S. courts, were just as damaging to the peace process as the “unity” pact that Palestinian Authority President Mahmoud Abbas has now signed with Hamas, a virulently anti-Semitic terrorist organization. Blumenthal sent dozens of e-mails advising Clinton on Israel in 2010. Before her March speech at the American Israel Public Affairs Committee (AIPAC), Blumenthal sent Clinton a breathless article from left-wing Israeli writer Uri Avnery accusing the Netanyahu government of “starting a rebellion” against the United States and defending interests that diverge from America’s. “I have to speak to AIPAC tomorrow,” Clinton responded. “How — and should I — use this [sic]?” Blumenthal promised to send another memo the next day. By the way, if you asked Likud, they would claim that AIPAC favors Israel’s leftist parties. Now Hillary Clinton is running for President. And she is campaigning on the basis that she is a friend of Israel, just as she did in the Senate, just as Obama did twice. As Secretary of State she was the architect of the policy of the most anti-Israel president since the rebirth of Israel in 1948. It was a policy which reflected views she has held her entire life. A belief she put into action exception of the nine-year period where she ran for and held the office of U.S. Senator from New York State. Let’s hope the Republican who gets the nod will not let the former Secretary of State get away with hiding her true past.